The dwarf surinam toad has a head that is narrow, with large eyes, and the snout is pointed. The tongue is lacking and the upper lip has a labial pocket at the angle of the jaw. They do not have any teeth. The skin is covered with small tubercles of varying size, density, and definition. On the head tubercles are smaller but uniform in size and distribution, while on the back they are dense and large. Upper parts of the limbs also have large tubercles but are not as numerous. The skull is longer than it is wide, and relatively elongated compared to other pipid species, though still possessing the characteristic wedge shape. These frogs have a uniform dark brown coloration on the head, back, limbs and associated tubercles. Ventrally, the dark brown fades into a light gray/tan, and may be unspotted or have sparse indistinct spots on the pectoral region. Some specimens have been reported as brown with tan tubercles and scattered dark brown spots, or blackish gray dorsally with obscure darker spots, and grayish white ventrally, with some spotting on the flanks and throat. While the feet have the same coloration, the webbing between the fingers and toes is completely transparent. The mouth structure is about half the head width and is terminal, slightly toward the ventral side of the head. The skull and jaws are largely composed of embryonic cartilage and are long, broad and flat. Tadpoles are dark gray-brown dorsally, with transparent ventral surfaces. The range of the dwarf surinam toad is Venezuela and northeastern Colombia. 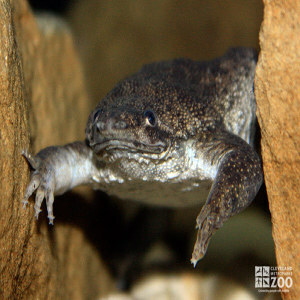 Dwarf surinam toads prefer lakes, ponds, and marshes which are located in flat, open areas. Incubation takes approximately 30 days. The dwarf surinam toad spends most of its life in water. It is an active, strong swimmer. As it swims, it holds its forelimbs out in front of its head. Each forelimb has four thread-like fingers, and each finger has a cluster of glandular filaments on the ends which are extremely sensitive to touch. These are used as sensory probes for food. It also uses these fingers to sift through mud for food when the water is too clouded with silt to see very well. The Surinam toad does not hibernate, is difficult to breed in captivity. It has been known to make metallic clicking calls. The most extraordinary thing about the dwarf surinam toad is the mating ritual. A male will clasp a female from the back, pressing her extended cloaca onto her back, and stimulating the skin on her back to swell. They will then somersault through the water (still clasped together), rising toward the surface. As they flip over, the female will lay 3 to 10 eggs, which will fall against the males' belly. He fertilizes the eggs and, still somersaulting, pushes them into the female's back. This is repeated until 40 to 100 eggs are laid. (Many eggs fall during the somersaults and are lost). Afterwards, the skin on the female's back shrinks and the eggs are enveloped in the female's back, each in its own separate, translucent skin pocket. The toads undergo metamorphosis while still in the pockets. The tadpoles' tails act much like placentas, exchanging nutrients and gases between the mother and tadpole. Two to four months later the mother will molt, opening the egg pits on her back. The toads will then hatch into fully formed miniature toads. Worms, insects, crustaceans and fish.